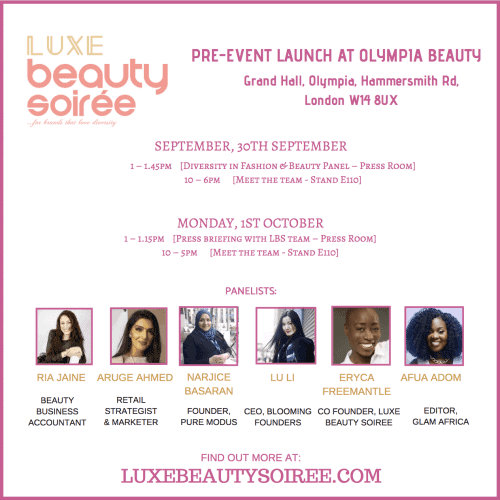 At Luxe Beauty Soiree (LBS) we celebrate Britain’s Diversity as we host exclusive beauty and lifestyle brands dedicated to; ‘Embracing all tones of women’. This exclusive event hosts industry experts most of whom are top in their fields, as well as bloggers, vloggers, influencers, international media, and diverse beauty/lifestyle brands. Our panel discussions with these experts cover the most topical issues affecting the industry, thus encouraging an open dialogue. The 2019 event will see us partner with Olympia Beauty, one of the UK’s largest beauty trade event organisers, and London College of Fashion (LCF), a world leading centre for fashion education which has been nurturing creative talent for over a century and is known to actively champion diversity through its numerous initiatives, events and projects. This partnerships will see us get even more access to the leading forces in British fashion, beauty and media industries. Ria-Jaine found her passion for beauty and resigned from her corporate role and set up her own accountancy business and beauty business. Finalist to MK Woman Leaders Awards 2018 and MK Beauty Awards for her contribution to the community as well as the successes of her new beauty accounting business which also provides accredited tax and accounting workshops to the industry. A proud champion for the UK wide beauty professionals against domestic abuse campaign, voluntary family support worker and trained facilitator for a community project entitled empowering parent’s. Serial entrepreneur Lu Li is the founder of Blooming Founders, a business social network and support community based in London for early stage female entrepreneurs. Through events and forums, it aims to connect female founders with tech talent, corporates, interns, industry experts and investment to give them a leg up on their startup journey’s. Lu was previously a brand manager working for a behemoth in the beauty industry and founder Dressed by Lu in 2012. Narjice is the founder of the world’s first online Modest Fashion, Lifestyle and Halal Consumer marketplace allowing sale of goods and services to the Muslim world under a single platform, thus creating the amazon of the muslim world. Narjice also manages and delivers a catalogue of professional courses on Project and Marketing Management courses and workshops, internationally to English, Arabic and Turkish speakers. Afua is a journalist and stylist, over the years she has worked at T4,PopWorld and ITV’s 60 Minute Makeoverand Blue Mountain Music under the watchful and legendary eye of Chris Blackwell. She was Editor at Blackhair,Features Editor for Pride and Producer/Anchor for Arise News ABN TV and ABN Radio. She is currently Editor in Chief at Glam Africa Magazine and also hosts niche TV show called Sustainable Energyfor CNBC. including, Best supporting actress at 2013 City People Entertainment Awards; and Best Actress in a Drama at the 2016 Golden Movie Awards, and Best Young Actress at the 2018 International Achievement Recognition Awards, London. Zynnell has featured in over 30 movies including Netflix’s ‘When Love Comes Around’. former ambassador for Professional Beauty GCC and contributor to Professional Beauty and Scratch magazines she is in demand across the globe. amongst others. Eryca has over 30 years industry experience including supporting beauty & lifestyle brands to communicate their brand message powerfully and effectively to their target audience. She works in Africa, USA, UK and Europe.